WARNING: Model can be much more complex based on number of characteristics you take, in this case it was only Month. If you really want to go for this approach ( have enmity with script or coding), do not use the base tables in JOIN_1. Use this model after you aggregate data to a certain extent. Obviously, you would like to avoid a join ‘m x m’ where m is a large number. Cumulative sum or running total can be easily done via Graphical Calculation view and it seems to be working. Note: This might still be easier to do in Scripted View or Reporting Tool . Scripted Calculation View is deprecated now, instead use Table Function. In Figure 1, our base data is in Column 1 and 2 and we want to add Colum 3 (“C UM_SUM”) to existing data set. Figure 2 shows overall design of the calculation view. b) Created one Calculated Column “DUMMY” on each projection and assigned it a value 1. You can assign any other constant value. 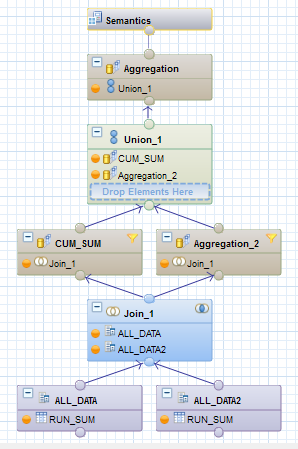 c) In join node (JOIN_1), (inner) joined these two data sets via “DUMMY” column. After joining output would be like below. If you notice, for every month now we shall have 12 records (overall 12 X 12 = 144). Where our Month matches with Month1 , that is our actual value for that month. And we need to sum all other values where Month >= Month1. 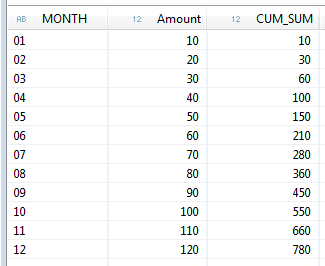 So, for above example, sum of 10, 20 and 30 would give us cumulative sum for Month 3.
and another to check If Month >= Month1 (refer Figure 4). We took Month and Amount_1 and renamed Amount_1 to C UM_SUM. e) Lastly, we need to union these two aggregation nodes. Take Amount from one node and C UM_SUM from another node. Result is in Figure 1 itself. Equivalent SQL Code would be as simple as below. 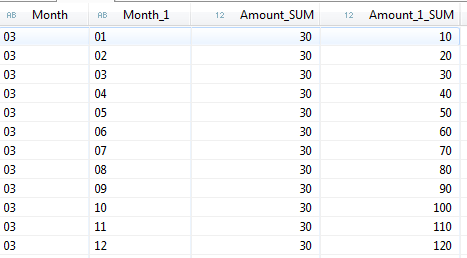 We can create a Calculation View (Scripted) or Table Function using this SQL. 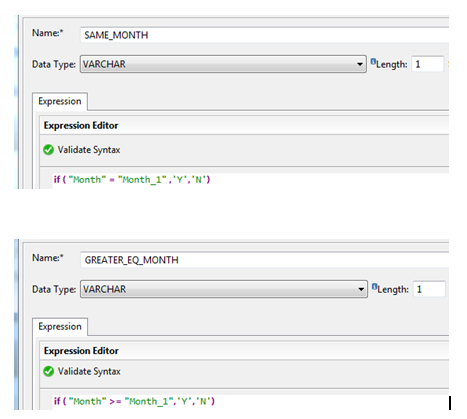 select "Month" , "Amount" , Sum("Amount") over ( order by "Month") from "<SCHEMA>". "RUN_SUM"
( SELECT CALMONTH , SUM(ORDER_QUAN) AS "ORDER_QUAN" FROM "MY_TABLE"